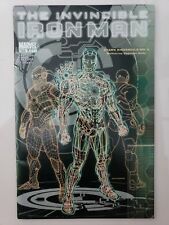 THE INVINCIBLE IRON MAN #500 (2011) MARVEL COMICS GIANT-SIZE ANNIVERSARY ISSUE! INVINCIBLE IRON MAN 500.1 ...VF/VF+.....2011...Matt Fraction...Bargain! INVINCIBLE IRON MAN 500 ...VF/NM.....2011...Matt Fraction...Bargain! DF Invincible Iron Man #500 Signed by Matt Fraction 205/300 Sealed w COA NM/M+! This page was last updated: 19-Apr 03:46. Number of bids and bid amounts may be slightly out of date. See each listing for international shipping options and costs.